To celebrate, Adventures by Disney will bring this story to life for guests sailing on a number of exciting new family river cruise itineraries with AmaWaterways in 2018, including “Beauty and the Beast” themed sailings along the Rhine. There will be six “Beauty and the Beast” itineraries aboard AmaKristina in 2018, with stops in areas that inspired the films including cities in France, Switzerland, Germany and the Netherlands. Rates start at $4289 for adults and $3829 for kids plus airfare. A 10% deposit is required to confirm your river cruise and free layaway is available for all 2018 sailings. Each “Beauty and the Beast” sailing includes screenings of both the animated and live-action films, a themed dinner and other culinary experiences onboard. 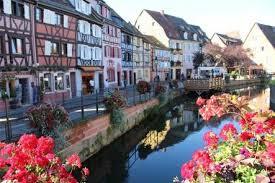 Each sailing also includes a stop in Riquewihr, France, a village that Disney animators used as inspiration for the village in the films. When it comes to an Adventures by Disney vacation, everyone is a kid at heart. So many adults have grown up enchanted by the Magic of Disney. Many would prefer and adult style Disney vacation without kids. Discover wine tasting and blending during vineyard tours and onboard seminars by a Master Sommelier. Explore Authentic dishes of Europe during intimate gourmet demonstrations of culinary mastery and history. Stroll through charming villages on a guided walking tour that incorporates local gastronomic delights. Discover the art of the Strasbourg specialty, tart flambé, during an interactive class, complete with local beer and Alsatian wine pairings. Create French patisserie class in Strasbourg. Explore German vineyards and visit festive pubs while sampling the hearty cuisine of the region. Tour the Heineken Factory, savor a special caramel waffle demonstration and learn how to blend craft cocktails during a private workshop in Amsterdam. In addition, Adventures by Disney will offer six Danube sailings aboard AmaViola. The Danube sailings stop in four countries—Germany, Austria, Slovakia and Hungary—and all include a stop in Salzburg to revisit scenes from “The Sound of Music,” along with a visit to Devin Castle in Bratislava. There is a special sailing of this itinerary in September 2018 for an adult-only Oktoberfest which will include theme parties onboard. Vacationkids Disney experts can help Travelers customize their trip to fit their needs by choosing from a variety of activity options offered at ports and onboard each day. Hurry and earn the love of others and confirm your cabin before the last petal drops!